After ten sold out shows at The O2 last year, Michael Bublé is coming back to the venue to play two nights in December (15 and 16) as part of his new UK arena tour. His ten nights here last summer were lauded by critics around the world and sold more than 150,000 tickets. One of the globe’s biggest stars, Bublé, has released six studio albums, won four Grammys, and his 2011 album To Be Loved still commands a Top 20 chart placing. These two nights are set to be epic. The O2, visually typeset in branding as The O2, is a large entertainment district on the Greenwich peninsula in South East London, England, including an indoor arena, a music club, a Cineworld cinema, an exhibition space, piazzas, bars and restaurants. It was built largely within the former Millennium Dome, a large dome-shaped building built to house an exhibition celebrating the turn of the third millennium; as such, The Dome remains a name in common usage for the venue. 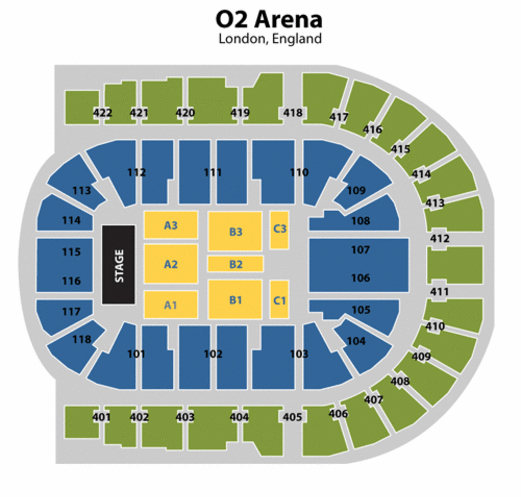 It is often referred by various names: the O2 Dome; the O2 Centre, which properly refers to an unrelated shopping centre on Finchley Road; or The O2 Arena, which properly refers to a smaller indoor arena within The O2. 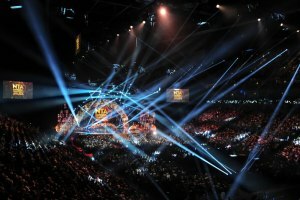 Naming rights to the district were purchased by O2 plc (now Telefónica Europe plc) from its developers, Anschutz Entertainment Group (AEG), during the development of the district. 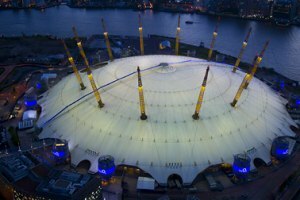 AEG owns the long-term lease on the O2 Arena and surrounding leisure space. From the closure of the original "Millennium Experience" exhibition occupying the site, several possible ways of reusing the Millennium Dome's shell were proposed and then rejected. The official renaming of the Dome in 2005 gave publicity to its transition into an entertainment district. The Dome's shell itself remained in site, but its interior and the area around North Greenwich Station, the QE2 pier and the main entrance area were completely redeveloped. The area is served by North Greenwich tube station, which was opened just before the millennium exhibition, on the Jubilee Line, and by bus routes. Thames Clippers operate a river boat service for London River Services; the present tenants, AEG, purchased Thames Clippers in order to provide river links between central London and The O2. As well as a commuter service, Thames Clippers also operates the O2 Express service. North Greenwich station is on the Jubilee Line in Zones 2 and 3. And it’s right on our doorstep. Get here from Central London in 20 minutes. Or Stratford in 10 minutes. River – Thames Clippers always runs a fast and frequent service between Central London and The O2.Boats leave major piers every 20 minutes. Inside the M25 and outside the Congestion Zone. The O2 is signposted from the M25, the A2 and A20 (from the South East), and the M11 (from the North). We’ve got 2,200 parking spaces just a short walk from the tent. London City Airport is on the DLR. Heathrow, Gatwick and Stansted have Express rail services into Paddington, Victoria and Liverpool Street. Catch the tube or bus from your station.